It took me awhile to figure out what I wanted to say about John Irving’s “The Cider House Rules.” On the one hand, it’s a celebrated classic by a genius author, and on the other hand, some of Irving’s not so celebrated works ruined a little bit of the magic. Many authors write books using a formula or recurring theme: everyone in Dean Koontz’s books owns a dog, Barbara Kingsolver explores troubled women, and every Irving book is a sprawling narrative of a character’s life story. Although this formula is pretty prominent, in Irving’s best books it doesn’t really matter that it’s there or that it’s repeated. The characters outshine the repetition and the formula hides in the backround. But in his lesser books, unfortunately, it comes out droll and a little bit cumbersome. “The Cider House Rules” was my seventh treck through Irving-land, with three of them having been not so wonderful. Basically, of course I liked “The Cider House Rules.” Who wouldn’t? 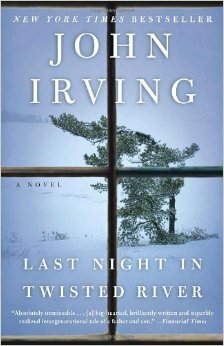 But I suggest to anyone who is planning to become an Irving fan to be sure to read his best novels first, and stay away from the others until they are the only ones left. I also suggest that you read at least ten or so books between each Irving. Anyway, that’s what I have to say. I’m halfway through my next book “The Round House” by Louise Erdrich, another wonderful author whose book I am having unfortunate troubles getting into. But we can fall off that bridge when we come to it. This entry was posted in Book Reviews, Fiction and tagged book review, books, fiction, John Irving, The Cider House Rules. Bookmark the permalink.